Volgens nieuwe berekeningen van de Verenigde Naties zijn er in 2050 bijna 10 miljard mensen op aarde. Vooral in Afrika neemt de bevolking fors toe. In bijna alle continenten neemt de bevolking toe – behalve Europa, daar komen we later op – maar in Afrika gaat het veruit het hardst. Volgens de VN verdubbelt het aantal inwoners van het continent de komende 30 jaar bijna. Van 1256 miljoen mensen nu naar 2528 miljoen mensen in 2050. According to the results of the 2017 Revision, the world’s population numbered nearly 7.6 billion as of mid-2017, implying that the world has added approximately one billion inhabitants over the last twelve years. Sixty per cent of the world’s people live in Asia (4.5 billion), 17 per cent in Africa (1.3 billion), 10 per cent in Europe (742 million), 9 per cent in Latin America and the Caribbean (646 million), and the remaining 6 per cent in Northern America (361 million) and Oceania (41 million). At the global level, the numbers of men and women are roughly equal, with the male population being slightly larger than the female population. China (1.4 billion) and India (1.3 billion) remain the two most populous countries of the world, comprising 19 and 18 per cent of the global total, respectively. Today, the world’s population continues to grow, albeit more slowly than in the recent past. Ten years ago, the global population was growing by 1.24 per cent per year. Today, it is growing by 1.10 per cent per year, yielding an additional 83 million people annually. The world’s population is projected to increase by slightly more than one billion people over the next 13 years, reaching 8.6 billion in 2030, and to increase further to 9.8 billion in 2050 and 11.2 billion by 2100. 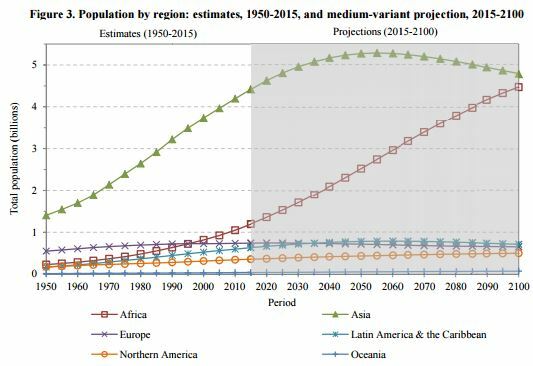 Read more in World Population Prospects The 2017 Revision (PDF). The world has never seen anything like the population explosion of the past century. The United Nations projects that the global population will top 9 billion by 2050 and 10 billion by 2100. But these projections are uncertain, as they depend on assumptions about the future, such as how many children a woman will have 20 or 30 years hence. This video, part of Science’s 29 July 2011 special issue on Population, highlights demographic trends around the globe, which offer a window into what our future world may look like.